A line passing through the origin (blue, thick) in R3 is a linear subspace, a common object of study in linear algebra. Linear algebra is a branch of mathematics concerned with the study of vectors, vector spaces (also called linear spaces), linear maps (also called linear transformations), and systems of linear equations. 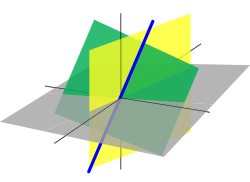 Vector spaces are a central theme in modern mathematics; thus, linear algebra is widely used in both abstract algebra and functional analysis. Linear algebra also has a concrete representation in analytic geometry and it is generalized in operator theory. It has extensive applications in the natural sciences and the social sciences, since nonlinear models can often be approximated by linear ones. Linear algebra had its beginnings in the study of vectors in Cartesian 2-space and 3-space. A vector, here, is a directed line segment, characterized by both its magnitude (also called length or norm) and its direction. The zero vector is an exception; it has zero magnitude and no direction. Vectors can be used to represent physical entities such as forces, and they can be added to each other and multiplied by scalars, thus forming the first example of a real vector space, where a distinction is made between "scalars", in this case real numbers, and "vectors". Modern linear algebra has been extended to consider spaces of arbitrary or infinite dimension. A vector space of dimension n is called an n-space. Most of the useful results from 2- and 3-space can be extended to these higher dimensional spaces. Although people cannot easily visualize vectors in n-space, such vectors or n-tuples are useful in representing data. 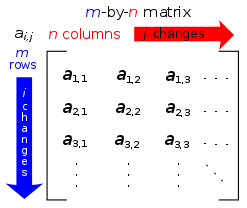 Since vectors, as n-tuples, consist of n ordered components, data can be efficiently summarized and manipulated in this framework. For example, in economics, one can create and use, say, 8-dimensional vectors or 8-tuples to represent the gross national product of 8 countries. One can decide to display the GNP of 8 countries for a particular year, where the countries' order is specified, for example, (United States, United Kingdom, France, Germany, Italy, Japan, Switzerland and Belgium), by using a vector (v1, v2, v3, v4, v5, v6, v7, v8) where each country's GNP is in its respective position. A vector space (or linear space), as a purely abstract concept about which theorems are proved, is part of abstract algebra, and is well integrated into this discipline. Some striking examples of this are the group of invertible linear maps or matrices, and the ring of linear maps of a vector space. Linear algebra also plays an important part in analysis, notably, in the description of higher order derivatives in vector analysis and the study of tensor products and alternating maps. In this abstract setting, the scalars with which an element of a vector space can be multiplied need not be numbers. The only requirement is that the scalars form a mathematical structure, called a field. In applications, this field is usually the field of real numbers or the field of complex numbers. Linear maps take elements from a linear space to another (or to itself), in a manner that is compatible with the addition and scalar multiplication given on the vector space(s). The set of all such transformations is itself a vector space. If a basis for a vector space is fixed, every linear transformation can be represented by a table of numbers called a matrix. The detailed study of the properties of and algorithms acting on matrices, including determinants and eigenvectors, is considered to be part of linear algebra. One can say quite simply that the linear problems of mathematics—those that exhibit linearity in their behavior—are those most likely to be solved. For example, differential calculus does a great deal with linear approximation to functions. The difference from nonlinear problems is very important in practice. Any two bases of the same vector space have the same cardinality; equivalently, the dimension of a vector space is well-defined. A square matrix is invertible if and only if its determinant is nonzero. A matrix is invertible if and only if the linear map represented by the matrix is an isomorphism. If a square matrix has a left inverse or a right inverse then it is invertible (see invertible matrix for other equivalent statements). A matrix is positive semidefinite if and only if each of its eigenvalues is greater than or equal to zero. A matrix is positive definite if and only if each of its eigenvalues is greater than zero. An n×n matrix is diagonalizable (i.e. there exists an invertible matrix P and a diagonal matrix D such that A = PDP−1) if and only if it has n linearly independent eigenvectors. The spectral theorem states that a matrix is orthogonally diagonalizable if and only if it is symmetric. Specific entries of a matrix are often referenced by using pairs of subscripts. An item in a matrix is called an entry or an element. The example has entries 1, 9, 13, 20, 55, and 4. Entries are often denoted by a variable with two subscripts, as shown on the right. Matrices of the same size can be added and subtracted entrywise and matrices of compatible size can be multiplied. These operations have many of the properties of ordinary arithmetic, except that matrix multiplication is not commutative, that is, AB and BA are not equal in general. Matrices consisting of only one column or row define the components of vectors, while higher-dimensional, e.g. three-dimensional, arrays of numbers define the components of a generalization of a vector called a tensor. Matrices with entries in other fields or rings are also studied. Matrices are a key tool in linear algebra. One use of matrices is to represent linear transformations, which are higher-dimensional analogs of linear functions of the form f(x) = cx, where c is a constant; matrix multiplication corresponds to composition of linear transformations. Matrices can also keep track of the coefficients in a system of linear equations. For a square matrix, the determinant and inverse matrix (when it exists) govern the behavior of solutions to the corresponding system of linear equations, and eigenvalues and eigenvectors provide insight into the geometry of the associated linear transformation. Matrices find many applications. Physics makes use of matrices in various domains, for example in geometrical optics and matrix mechanics; the latter led to studying in more detail matrices with an infinite number of rows and columns. Graph theory uses matrices to keep track of distances between pairs of vertices in a graph. Computer graphics uses matrices to project 3-dimensional space onto a 2-dimensional screen. Matrix calculus generalizes classical analytical notions such as derivatives of functions or exponentials to matrices. The latter is a recurring need in solving ordinary differential equations. Serialism and dodecaphonism are musical movements of the 20th century that use a square mathematical matrix to determine the pattern of music intervals.